Exciting, new and innovated 3 minute open time glue stick ! Tecbond 280 is a polyolefin based adhesive which has been formulated to combine a long open time and high hot tack with excellent adhesion to a wide range substrates. A bead can still give excellent adhesion on wood up to 3 minutes after application at 195°C (depending on bead width). Also bonds made quickly are adjustable up to 3 minutes after adhesive application. 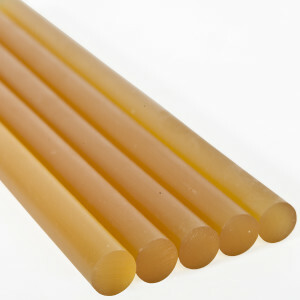 Available in 12mm , 15mm and 43mm sticks and slugs suitable for Tec glue guns. Previously a glue stick stated as long open time could achieve at best 45 secs before reaching the point of setting or worse achieving a cold bond. Tecbond 280 is the first glue stick to hit the market offering extended open time to approx 3 minutes.